Earlier this month, we embarked upon a major weekend road trip through Tennessee and Georgia. I really think we were in the car for more hours than not. Needless to say, it was a great time visiting friends, enjoying the outdoors, and witnessing the marriage of a lovely couple. The wedding location was perfect! Stunning! Magical! We had a wonderful time! The couple recommended several activities that wedding guests could participate in during their stay. One of them was to go apple picking at Mercier Orchards. We jumped on the chance to both enjoy the beautiful countryside and to take home a nice cache of apples. The selection of apple varieties was fantastic and the staff infinitely knowledgable about every facet of the apple biz. 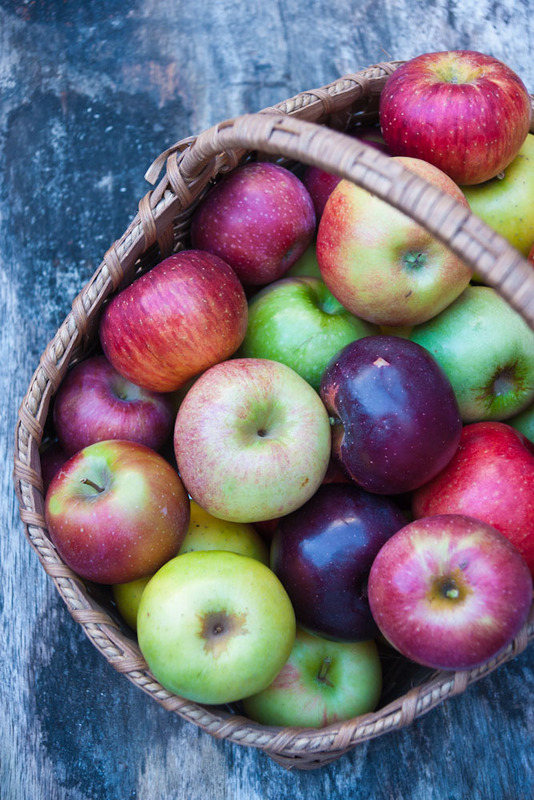 A definite bonus to our apple picking experience is that Mercier Orchards allows guests to taste as many apples as they can stomach so you know the flavor and texture of every apple you take home! By the time we finished picking, we had a whopping 9 varieties (not to mention very full bellies)! Anyway, now that I have that out of my system, we can get down to recipes. I’ve got three for you (with an option to make a 4th). The kitchen smelled so good when I made these that I ate 3 within an hour of taking them out of the oven. If you don’t want to cook them all at once, freeze the uncooked scones and cook to order. Preheat oven to 375. Peel and core apples. Cut eighths, then cut each wedge in half lengthwise, giving you 1-inch chunks. Roast on a parchment or silpat lined cookie sheet for 20 minutes. Cool. Combine all dry ingredients. Stir in butter and cheese. Add wet ingredients, including 2 of the eggs, lightly beaten and apples. Stir until just mixed. Don’t over-blend. Dust counter generously with flour. Place dough on floured surface and dust lightly with flour. This dish is perfect for a simple, romantic dinner for 2 but can be easily be multiplied for a delicious family meal. You can play around with the root vegetables that you pair with the apples. I’ve used parsnips and carrots in place of the turnips with delicious results. Preheat the oven to 400 degrees. Toss the pork chops with 1/2 of the marinate. It’s great if you can let it marinate overnight but I usually forget that part and just let it soak up the marinade while I’m prepping and roasting the vegetables. Toss the remaining marinade with the vegetables. Spread in a single layer on a parchment lined sheet pan. If you are doubling the recipe, you should probably divide the vegetables over 2 sheet pans. Roast for 35 minutes, stirring half-way through the cooking time. 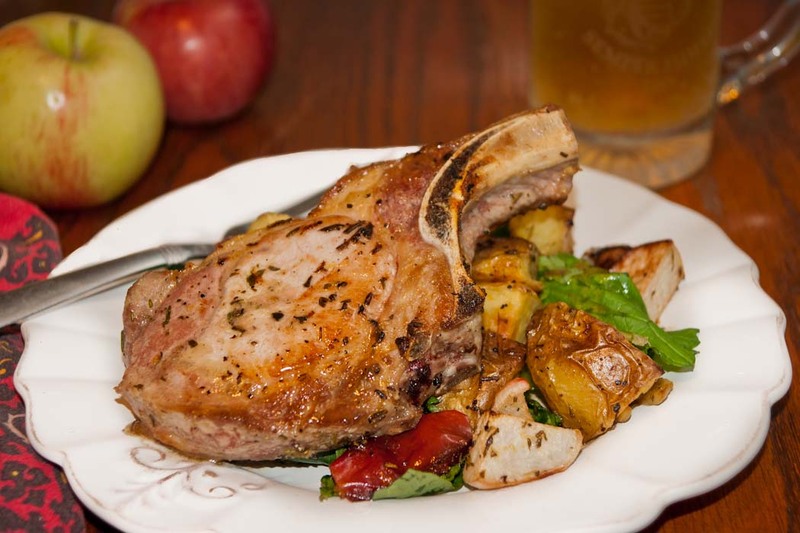 Heat a skillet on high and sear pork chops for 1 minute on each side. Place in oven on top of the vegetables and roast for 7 minutes. Meanwhile, pour the broth/wine/cider into the pan that you seared the pork in over medium heat. Stir until reduced by half, scraping up any brown bits attached to the bottom of the pan. Remove from heat and add butter and lemon. Pour over finished pork chops. These are an awesome topping for everything from oatmeal to ice cream. You can even drain some of the juice off and top with pie crust or crumble topping for a quick dessert. 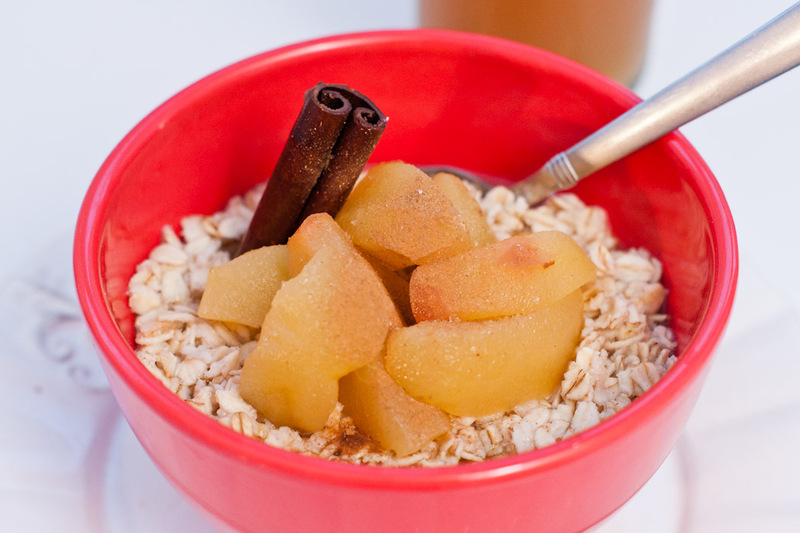 To make the stewed apples into applesauce, just remove the whole spices and puree in the food processor. Place ingredients in a medium saucepan. Cover. Bring to a boil. Reduce heat to low and simmer for 15 minutes, stirring occasionally. Remove apples with a slotted spoon, leaving behind juice. Increase heat to medium-high and reduce until juice is syrupy, 4-5 minutes. Pour syrup over apples. They are definitely worth turning the oven on for! 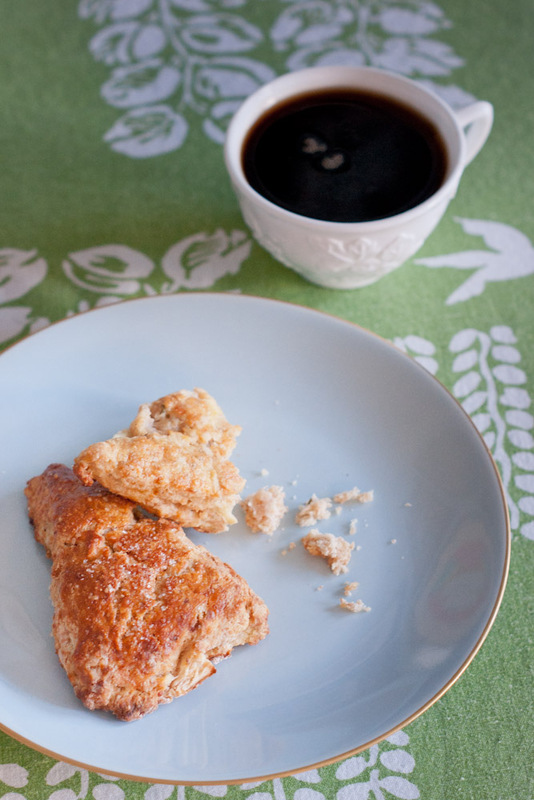 I so want to try the apple cheddar scones! That sounds like a wonderful combination. I used to hate fall foods, but now they seem to be my new passion. It’s funny how your tates change when you get older.